Good morning lovelies, I hope you're all well? 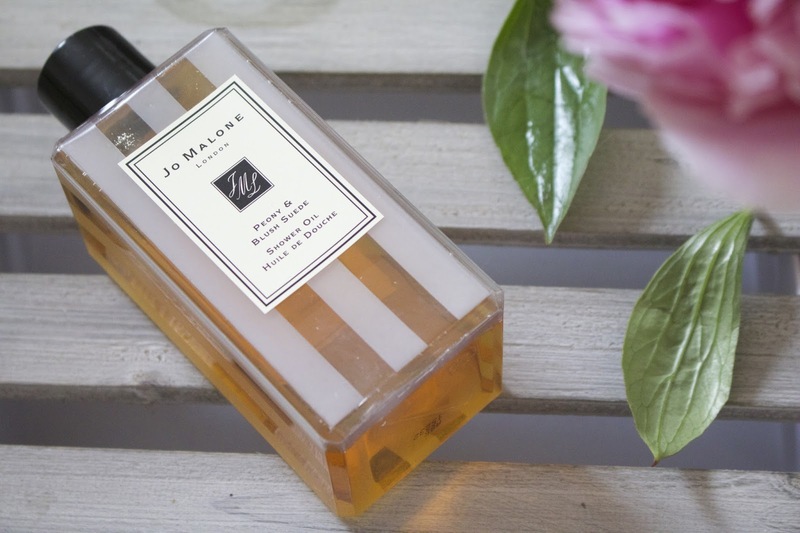 Recently I made a little trip to one of my favourite stores, in search of a new body product to ease the fact that my skin had become a little dry over the previous months, I headed into Jo Malone. Automatically presuming I would've been picking up some form of moisturiser, I found myself sampling the body cremes, the scents were gorgeous and that was my problem, I liked them all! I think the sales assistant could sense I was struggling on what to purchase, she came and advised me on what particularly I was in search of, and also which scents in general I like, she suggested I have a hand and arm massage with herself, using some of the scents she recommended from what I had told her I personally like from Jo Malone. We chose Wood Sage and Sea Salt in the body creme and on her recommendation, the Peony & Blush Suede shower oil, a product I had personally never tried from Jo Malone! She applied a generous amount of the heavenly smelling oil onto my arms which lathered into the most luxurious milk, the fragrance is incredibly light and almost undetectable until you catch it upon a whim and wonder where the scent is coming from. Once she washed away the oil she asked me to feel my skin, it felt incredibly soft and supple, you would've thought i'd done a full body scrub and moisturised it was *that* soft, I just couldn't stop touching my arms and wondering how it had become so soft from one quick application of what seemed like a body cleanser? To finish off she applied a small spatulas amount of body creme in the Wood Sage and Sea Salt scent (one of my personal favourites in scent from the collection). I ended up picking up the Shower Oil as I absolutely loved the way it felt alone, it was moisturising enough by itself for me to want it, plus I also loved the ease of use, knowing that I could use this in the shower without having to apply much effort or take into consideration 'dry time' as you would with a body creme! Upon using this at home, Ive realise how long the oil is going to last, you honestly need the tiniest amount, a little goes a really long way! If im feeling particularly in need of some moisture, I use a second application of it on my skin and just allow the shower to gently wash off the oil without using any force to remove it, this allows a light layer of the oil to stay on my skin leaving it feeling super soft and luxurious, without feeling as if there is any residue on my skin, it feels almost invisible on my body but allows an extra level of moisture to penetrate my skin! I really feel that this is going to be one of those beauty products that you just keep repurchasing throughout the years, it has become a daily staple in my routine and something I can honestly tell my skin is missing if i forget to use it. Asides from the beautiful packaging it really is a super luxurious and splurge worthy product that I can honestly say you should own in your collection! Are there any Jo Malone products you can recommend, I absolutely adore their candles and diffusers, but am yet to branch out into there perfumes, which is something I would really like to add to my stash, but yet again there are SO many scents I just don't know where to begin, so any advice or personal recommendations will be greatfully recieved.